Approximate shipping weight: 56 lbs. I had purchased one of the other name brand units - but the drawers were too shallow for my tools to be in their cases, but this unit fits perfectly. I have starrett dial calipers from 6" to 12" all in soft cases or the starrett wooden cases. This was something I really wanted, and this case delivers. I got the matching roller cabinet as well, and am sorry to see that the risers are no longer being made. Excellent box for the price. Back ordered for over a year but for 1/10th the price of the competition is was well worth the wait. Damaged in shipping but customer service was excellent and straightened it out without issue. Looks good and is exactly what I needed. Used for hobby tools. This is a beautiful chest. However, I use this as my jewelry chest. I was looking for the long slim drawers and happened upon your website. As I said, it is beautiful and fits MOSt of my jewelry. The other drawers fit my other items. Very good value for an all-wood piece. The finished quality is great. This is the seventh Grizzly wood drawer chest we have added to our shops, each equipment station now has its own dedicated drawer chest, one with a drawer cabinet base. They all have preformed perfectly, only one needed to have the lock assembly cleaned and oiled due to some sanding dust. The Felt- lined drawers protect our tooling and gages. As we add equipment and tooling we will purchase more. This was an awesome buy. Quality item with very high level of finish in fact way better than pictured. The three hinges are firm and precise, locking the side panel and lid in place. The velvet green adds a touch of class in lid and drawers and also the back of front panel which can be pull down for a work area and can be tucked away sliding into the unit itself. The front panel slots neatly into the groove at bottom of case and then can be locked down, keys for locks provided. This for me was the perfect fit for my pocket watches tools and accessories, including enough space to keep watches in. Good room in the top of the chest for deeper objects. The versatility of this chest is a seller in itself. Corners are protected with chrome fittings, another nice touch. To add even more, two strong handles to carry the chest around ...not that I do, it lives on my desk. 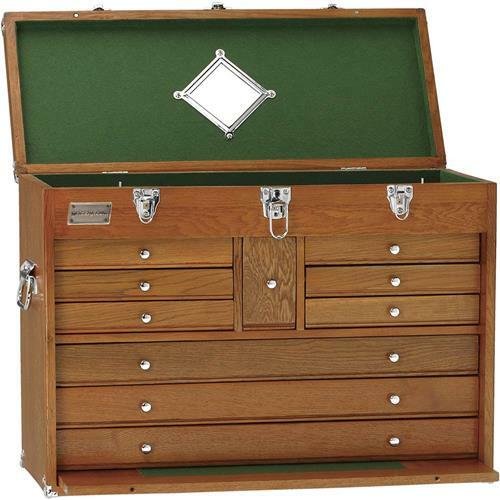 I would recommend this to anyone purely on the quality...this is not a cheap deal but a very well priced, quality chest that would last many years. Ideal for the hobbyist, jeweler and anyone who wants a classic oak storage unit that has an antique feel to it.... when closed it adds to the nice clean lines and rate this product very highly. Delivery was excellent and packed well . Chest was not marked in any way. I might even buy another if I fill this one up... buyer you will not be disappointed. Great box for the price. I bought this to supplement Storage for some recent purchases and I'm glad I bought this box. I bought it to put in the spare bedroom to store my tools. After I saw how nice it looked I ended up putting it in the living room underneath several pictures. After reading the reviews I had some concerns but didn't find any of the problems that others had with their product. Before this I had my tools stored in our shed on the patio it sure is nice having them really available inside the house. The product is an excellent piece of workmanship, and I am glad that I purchased it. The center lock does not work, and you had sent me a card saying that you would send a new lock, this was in April 2017. Now that it is June 1, 2017, no lock has arrived as yet. Otherwise, I have no complaints. The pictures on the web site don't do this chest justice. The wood on mine is much nicer looking. The drawers are smooth and pull easily. the fit is outstanding, all in all I got a great deal on a great tool chest. I use mine to hold my reloading/gunsmithing tools and I wanted somthing nicer than your basic painted steel chest. This did the job. I am very happy with the chest I purchased. Well worth the price. Great box , decent fit, very good value, would recommend the product. Great value. Packed well and shipping was fast. Looks great. 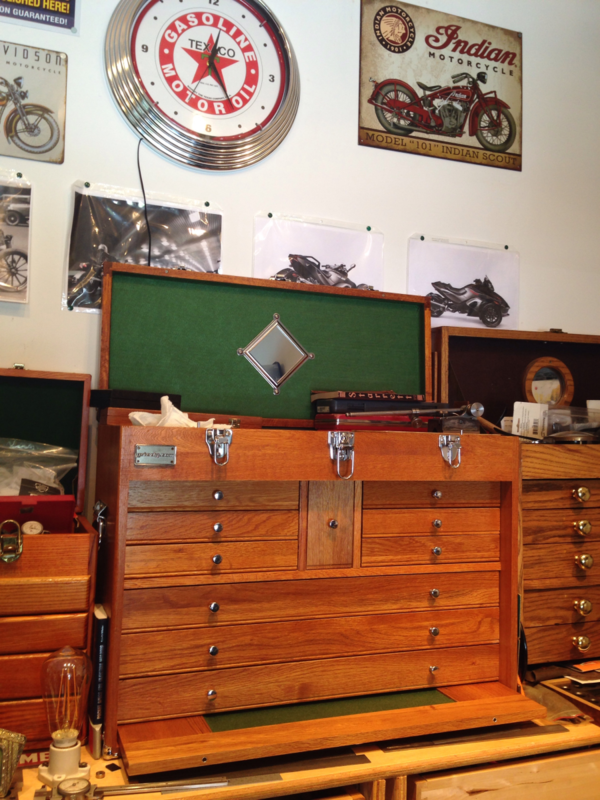 Nice Machinist box. Plenty of room for all my tools. We bought this for our son for Christmas. He said that the chest was made well and is sturdy. Drawers pull in and out easily. Made strong and the craftsmanship in manufacturing shows. This was a gift from my husband, specifically for my jewelry tools and supplies. Well constructed and meets my needs.